The ad was produced on behalf of the No-camp ahead of Venezuela’s February 15th referendum on lifting term limits, a proposal that would allow Hugo Chávez to stay in power for life. You can see it on YouTube, if you want. Where you probably won’t see it, though, is on Venezuelan television. Under rules set by the pro-Chávez National Elections Council, the Council itself gets to decide at what times campaign ads can go out, and on which channels. They deny that this amounts to prior restraint, but unexplained “delays” are keeping “Hall of Fame” and a series of other “No”campaign spots mostly out of sight. The ads show only on a few channels, and never in prime time. “It’s not that we’ve gone away, it’s that we’ve been gagged: they’ve taped our mouths shut,” is how No-campaign leader Julio Borges puts it. As it gets shut out of the air-war via mysterious administrative delays, the opposition’s boisterous student movement is systematically harrassed on the ground. In a speech last month, Chávez urged his security forces to “give them some of that good old tear-gas” whenever student protests got out of hand, a green-light that was immediately followed by a spike in heavy handed repression against the kids. Last Friday, he ordered the security forces to “step up surveillance” of the student movement, on vague allegations that they are “plotting to cause chaos”. More than campaigning, the opposition is just struggling to keep its head above water. Chávez, meanwhile, is going all out to ensure he wins Sunday’s referendum “by a knock-out”. Deploying the massive resources at the disposal of Venezuela’s cash-flush petrostate, he’s taking no chances and sparing no expense. “Evander Hollyfield against a 12-year old kid. That’s how it feels,” according to one Caracas resident. Eleven state owned TV channels and hundreds of government financed “community radio stations” broadcast Si propaganda round the clock. All sorts of public buildings, from schools, to state government offices, to Venezuela’s IRS to the country’s national worker re-training institute are plastered with “Si” propaganda. State owned electric utility crews are tasked with putting up Si signs. Civil servants are strong-armed into “volunteering” and raising funds for the Si campaign. Nearly every government website sports a “Si” banner ad. Nothing is off-limits. “Si” propaganda gets piped into the Caracas Metro, over the PA system. “The next station is Sabana Grande – please remember to vote Si on February 15th.” Even the wording of the referendum question itself is unabashedly partisan, a 77 word long ramble that consciously echoes Si campaign themes by asking voters whether they approve of “broadening people’s political rights” without ever mentioning term limits as such at all. Perhaps most worrying is that PDVSA, Venezuela’s giant state-owned oil company, is getting in on the game. At the end of January, a massive caravan of PDVSA tanker-trucks paraded through the streets of Caracas, decked out in “Si” propaganda. Cars parked at PDVSA parking lots have their windows decorated with “Si”s, in big white letters, whether the driver likes it or not. Reuters reports that, on a recent visit to the Energy Ministry, one oil industry executive found the building nearly empty. When he asked where all the civil servants had gone, one of the few left holding the fort told him everyone had taken the day off to go to a “Si” rally. 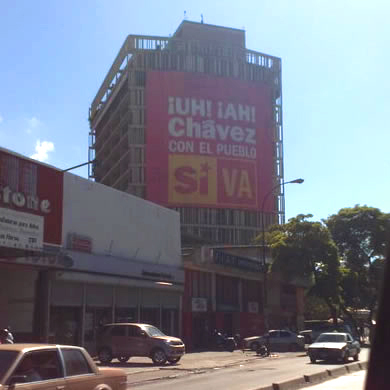 In effect, Chávez has turned the state itself into an appendage of the Si campaign. It matters little that this is blatantly unconstitutional. With die-hard Chávez loyalists installed in every key post in the state – from the state-owned media to PDVSA from the courts to the Elections Council – there’s really no down-side to flouting constitutional rules. No matter how well documented, opposition cries of foul are flatly denied or, more usually, ignored altogether. Of course, this kind of shenanigan isn’t new in Venezuela: fifteen months ago, Chávez was defeated in his first attempt to abolish term limits after a campaign that saw its share of abuses. But the scale of the Si’s advantage this time around is simply unprecedented, especially on the air. It’s not just the Ad Gap, it’s the Free Media gap too. A study released last week by Venezuelan and Swedish media researchers found that 93% of the news stories in the flagship State-run TV channel, VTV, favor a “Si” vote with the remaining 7% classed as “Neutral”. Another prominent State-run station broadcast 100% Si-friendly news coverage. Neither of the two main state broadcasters has aired a single news story favorable to the “No” campaign. On the other side, neither of the last two remaining dissident TV stations can broadcast free-to-air to a nationwide audience. Globovision (59% “No-friendly” news coverage) broadcasts only in a handful of cities, while RCTV (91% “No-friendly”) is available only via cable and satellite, now that its broadcast license has been revoked in retaliation for its critical news coverage. Mr. Hollyfield, meet your opponent. The extremely aggressive Si-campaign shows a government well aware that large majorities of Venezuelans oppose lifting term-limits in principle. They know only an extremely lopsided campaign is likely to bring those numbers around. So far, it’s working: while polls taken in December showed the No-side ahead by 15 to 20 points, polls taken in late January show a dead heat. Even if the Si camp were to lose again, all signs are that the government will simply keep holding new votes, year after year, until it eventually gets the answer it wants. The government campaign is centered on a simple message: Voting “Si” does not mean making Chávez president for life. It means giving the people the chance to re-elect him as many times as they want. The proposal would expand people’s political rights, they say, by removing an arbitrary restriction on their choice of candidates. Since free and fair elections will still be held every six years, the voters will always get the final say. It’s an argument that refutes itself. The massive abuse of state resources we’ve seen this year tells us all we need to know about how free and fair those future elections are likely to be. In addition to the natural advantages of incumbency, Chávez’s perpetual re-election bids would leverage the full might of the Venezuelan petrostate, just as the Si-camp has: a massive built-in advantage that makes Simón Bolívar’s 190 year old warning urgently relevant today. As one of the other TV spots that the chavista Elections Council is keeping mostly off the air puts it, there’s one other country in the region that holds massively unfair elections at scrupulously regular intervals: Cuba. With political speech limited, the state fully mobilized against dissidents and the incumbent enjoying unlimited access to state resources, Cuban elections are about as democratic as the regime whose windows they dress. All signs are that that’s the model Chávez wants to follow.